Recently Google take a decision to closed down Google reader service just by leaving a room for taking back up. In past Google shut down many popular services which is not doing good for them. So it is always better to take backup all of your Google data. If you need to take back up all of your Google data use Google takeout. It is not a new service from Google, which is launched more than a year ago. You can take backup all of your data from Google servers using Google takeout. It includes videos uploaded to your YouTube, all links that you plus one and shared in Google +, Picasa Web Albums, Blogger and many more. Now you can see available services which is available for backup from Google as archive. That will take you to next step where Google will show the status of archiving that you required in previous step. If you prefer to back up from each service, please click “choose services” tab in step 2(step 1 figure). After clicking that, you can see available services from Google. Click Google drive in that list. When status reaches 100% click create archive button. 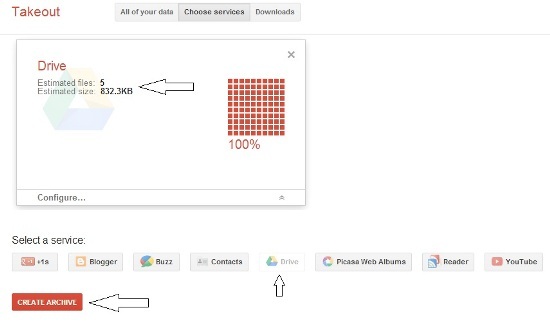 In next step you can download Google drive data by clicking download button. Then you may prompted to enter your Google account password. Then download will start automatically. Downloaded file will be in archived format. You can unzip downloaded zip file, to get all of your Google drive contents which includes docs, PDF and PPT files that you shared in Google docs. If you requested entire Google data backup, your download file has all those service backup in separate folders. 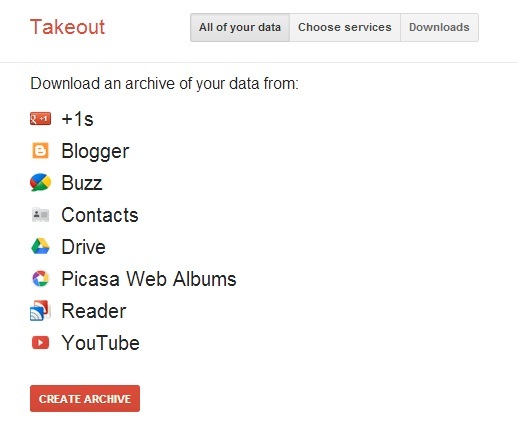 Now you completed backup of your entire Google account data using Google takeout. I hope you enjoyed reading this article and this awesome tool from Google. So Google takeout is a nice service from Google which will help you to backup data to your personal computer.